by Ralph A. Rossum. Lawrence: University Press of Kansas, 2001. 216pp. Cloth $34.95. ISBN 9780700617777. Paper $16.95. ISBN 9780700617784. Reviewed by Christopher Brooks, Dept. of History, East Stroudsburg University. When thinking of bingo, many Americans think of septuagenarian and octogenarian neighbors, friends and relatives enjoying a Wednesday evening. This harmless image is perhaps why many would be surprised to learn that holding bingo on a tribal reservation in Indio, California in 1980 precipitated a series of events that led to the nation’s highest Court needing to decide, among other legal questions, whether states could police such activities on tribal lands. Ralph Rossum has provided scholarship with a concise rundown of this issue, and to him scholars interested in how tribal gaming came to be legally accepted are certainly indebted. 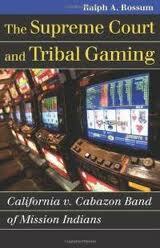 Most scholars would fairly place The Supreme Court and Tribal Gaming: California v. Cabazon Band of Mission Indians within the genre of legal history, more specifically within the subheading of tribal sovereignty. Beginning with the Grotius and the advent of international law and ending with Class III gaming cases that address the Cabazon legacy, Rossum rather adroitly covers the gambit of all that historically affected the Cabazon case, with special attention to the United States. Despite the scope of historical coverage, it reads in most places like a law book, one which this reviewer enjoyed. However, aside from a few sections, most undergraduate students interested in the topic may have difficulty tackling it if this text is their introduction to tribal sovereignty. It comes across as a text that will help the law or graduate student more, as well as the seasoned scholar. Rossum is cautious about how he presents the intent behind and ultimate legacy of the 1987 Cabazon decision. In the 6-3 opinion, Justice Byron White declared for the Court that a state’s regulatory interest must outweigh that of federal and tribal authorities in order to enforce a law., Justice White stated that the goal of the Court was “to proceed in light of traditional notions of Indian sovereignty and the congressional goal of Indian self-government, including its ‘overriding goal’ of encouraging tribal self-sufficiency and economic development” (Cabazon, at 216) This quotation was from the four year old case of New Mexico v. Mescalero Apache Tribe, and thus Cabazon was rooted in questions of sovereignty, not substantive questions about gambling. In fact, Rossum avoids delving into how the tribes have been treated is right or wrong. He allows, rather, the evidence to inform the reader on how to interpret that factor. Nowhere does Rossum argue that the Cabazon Court intended widespread tribal gaming, nor does he assert that such a phenomenon would necessarily follow. Importantly, Rossum provides the reader with a comprehensive overview of the significance and relevance of Public [*394] Law 280 to his subject. The 1953 law mandates individual states’ authorities to enforce criminal laws and grant civil jurisdiction over tribal lands within the borders of five states (California, Nebraska, Minnesota, Oregon and Wisconsin) without tribal consent. Fifteen years later the Indian Civil Rights Act amended Public Law 280, obliging the “non-mandatory” states to obtain tribal consent (p.68). In demonstrating the social history Rossum has woven into his narrative, the discussion of the 1968 Act also takes note of the “mandatory” states being left with the proverbial “unfunded mandate”. To set the stage, Rossum points out to readers that assimilating the tribes had gained traction the United States by 1880s. However, it may have been useful to at least briefly note that the practice possessed a lengthier history, one that provided the basis for many European colonial policies , as illustrated by the proselytizing by Spain, France and, eventually, Britain, the mother of most things American,. Plainly put, explaining historical norms simply helps the reader. This fine work does have a few other spots where the author may have added some more information for clarity’s sake. Returning to Rossum’s discourse on assimilation, that portions could have been even stronger with more historical signposting. For example, when noting the hostility toward the tribes during the latter nineteenth and early twentieth centuries (pp.55-63), he might have considered a brief mention of the nativist wave in US politics at the time, as it was indeed a recognizable historical epoch in US history that played a role in all aspects of US policy – then as now – not the least of which being with the North American tribes. In the same vein, Rossum’s discussion of the Indian Gaming Reform Act (pp.68-69) may have been more helpful had he reminded the reader of the significance of how self-determination in the 1950 and 1960s coincide globally and nationally. As Cassese (1998:71) points out, “[b]etween the early 1950s and 1960s . . . the principle of self-determination was vociferously invoked within the United Nations to legitimize the termination of colonial rule.” This is a point that could have thickened Rossum’s description. As to the aftermath of the 1987 Carbazon decision, Rossum provides a compendium of case law that tells the story of how the Court has slowly mitigated tribal sovereignty despite the IGRA. To his point, despite the 1908 Ex parte Young case, which generally allowed suits against state officers despite the Eleventh Amendment bar, the Court ruled contrarily in the 1996 term’s Seminole Tribe v. Florida. As Prince (2000: 448-49) puts it, the “Court denied the tribe the right to bring a suit under the Ex Parte Young Doctrine because there was another, statutory remedy. At the same time, the Court struck down that very statutory remedy. The principle of state immunity had swallowed up all common sense.” That said, Rossum points out that the attempts to compact with the states achieved a clear picture of the diversity of the tribes and their various relationships with a given state; it allowed the tribes to negotiate as sovereigns should. In Rossums’ words, “What one tribe is willing to negotiate in terms of ‘raising [*395] revenues to provide governmental services…another may not” (p.180). Finally, it is worth remarking that Rossum focuses not only on the “what” but also the “how” by explaining the canons of interpretation for statutes. This information possesses utility for the educated reader with a brief, well-written reminder of what the more expert reader of law who has been versed by hundreds of pages on contract, common law and statutory interpretation canons is likely already familiar with. By explaining, for example, that ejusdem generis refers to something of the “same class, kind or nature” (p.50), Rossum forces the reader to think within the paradigms of legal structures and strictures as necessary to fully appreciate the scope and difficulties of not only writing but also – and more often – interpreting law. In general, the strength of The Supreme Court and Tribal Gaming is in its weakness: there is a considerable amount of information for a book of under 200 pages. The process of condensing it may prove troublesome for readers less familiar with the subject matter, but it is very worthy of the challenge. This work is of great use to those familiar with legalese and at least some of the case law and will help those looking for learning a bit more on the matter, but those individuals should be prepared with a copy of Black’s Dictionary. Thus, one should therefore not assume that the book’s pith is a sign of lacking substance, for that could not be further from the truth. This well-written, thoroughly researched work will be cited time and time again by scholars to be sure – including this one. Cassese, Antonio. 1998. Self-Determination of Peoples: A Legal Reappraisal. Cambridge: Cambridge University Press. Prince, John Randolph. 2000. “Caught in A Trap: The Romantic Reading of the Eleventh Amendment,” Buffalo Law Review 48: 448-449. Ex parte Young 209 U.S. 123 (1908). Seminole Tribe v. Florida 517 U.S. 44 (1996). Copyright 2012 by the Author, Christopher Brooks.